Will Gold Prices Rise in 2015? Experts are predicting that gold prices will increase in 2015, with volatility in the global market prompting investors to turn to gold. Gold prices haven’t really been doing very well in the past years. In 2011, they reached a record high of $1921.50 per once but have not risen since then. In fact, in 2014, gold was only traded for around 1,230 an ounce. In an interview with British publication The Telegraph, fund manager Evy Hambro of Blackrock Gold and General, stated that, gold has “bottomed out” and is due for a price recovery. Mr. Hambro argues that, with the European Central Bank expected to print billions of new euros to boost growth and stave of deflation, not only will European equity markets receive a boost but gold as well. “In periods of uncertainty people reach out for gold as a safe asset. With this loose monetary policy around the world and fears around deflation, people will want to reach out for safe assets and gold is the natural place that people will move to as a store of wealth,” Mr Hambro said. Mr. Hambro isn’t the only one optimistic for gold in 2015, HSBC has also raised its average gold price forecast for the year. The reason given was that, due to the growing strength of the dollar and global geopolitical fears, gold’s reputation as a “safe-haven” investment will make it even more attractive to investors. An increase in gold prices has already been seen for this year, following the news on January 15 that the Swiss National Bank had abandoned their three-year-old cap against the euro. 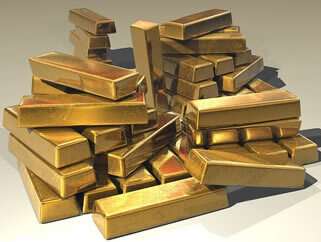 Following the news, spot gold rose to $1,252.06 an ounce by end of the day (1226 GMT). “Gold is gaining from a risk-off situation because nobody expected the Swiss central bank not to keep that cap, and this has created potential big losses in many places and is obviously triggering some flight to safety,” Saxo Bank senior manager Ole Hansen said in Reuters. Commerzbank is also predicting a rise in gold prices for the second half of this year, spurred by plans from the U.S. Federal Reserve to raise interest rates in 2015. According to Commerzbank, there will be two distinct phases for the gold price in 2015. The first phase would be a decrease in price for the first six months of 2015, due to increased speculations about interest hikes. However, once interest rate hikes are in place, the pressure on gold is likely to abate and a rise in price will be seen in the second half of the year. The Commerzbank forecast sets the gold price at $1,125 for the first half of 2015 and $1,250 for the second half of 2015. Volatility in global markets has often prompted investors to channel their investments in gold which is considered a “safe haven” investment.